This vaginal scan was taken when I was 5 1/2 weeks. The lady said there was only one baby because she could only see one heart beat, but that she had no idea what the thing was in the top right of the picture. I've been sick from the day I conceived. Any advice would be good. I am now 10 or 11 weeks and I won't get my usound scan until I'm 13 weeks, I've got 2 1/2 weeks to wait for my scan, on 16 October 2009. Help anyone, what do you think? Could it be twins? My doctor could tell on my first exam...The doctor said I was a "little large" and we had an ultra sound which determined there were two in there. you were more than 5 1/2 weeks, because the sac is big and you can see the embrio. You can start to have a heart beat perceptible at only 6 week. At 5 weeks, you would see only a black area like a small egg. You had to be around 7-8 weeks when this was done. What is the right upper area? well, tell her to move her probe and to look around. If she doesn't, yes she may miss a twin. no.. the ultrasound lloks like a yolk sack. so looks like a baby and a yolk sack. I just reread your post and saw your next ultrasound is coming up on the 16th, so never mind my question, lol. 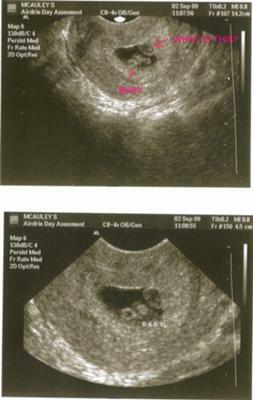 I had my first ultrasound done at 6 weeks and found out I was having twins then. She saw both babies with the regular ultrasound and then switched to a vaginal scan to get a better look and was able to hear both heartbeats that way. When's your next ultrasound? Strange that an ultrasound tech wouldn't be able to tell you what something is... I'd defintely say that if there was only one heartbeat, then there's only one baby as well though.